QUALE CITTADINANZA PER QUALE UNIONE? MODELLI E PROSPETTIVE DI UNA CITTADINANZA COMUNE EUROPEA. In recent years, the European Union has faced a series of political and social challenges that have threatened the foundations of its integration model. Since 2008, the economic and financial crisis has put into question the achievement of the single currency and the sustainability of the European welfare system. 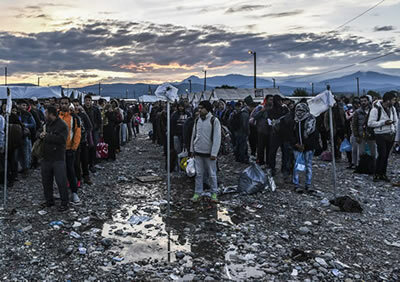 The emergency linked to migratory flows in the Mediterranean and through the Balkan route, together with threats to European security arising from the instability of the neighborhood and terrorist attacks, led to a retreat on the principles of free circulation and solidarity in Europe. The scenario and the progressive disaffection of citizens from the European project have encouraged the emergence of populist movements and the strengthening of Eurosceptic parties, and a referendum pending in the UK to decide to withdraw from the Union. These trends undermine the internal cohesion of the Union, but also its ability to project internationally. Ultimately, the EU must rethink its model through a revision of the bases and mechanisms of the integration process, particularly in the areas most affected by the ongoing crisis. To this regard, the definition of models and prospects of a European Citizenship is a crucial issue, in times of resurgent nationalisms and increasingly widespread fears that fuel anti-European and Eurosceptic movements, in order to promote more advanced forms of pooled sovereignty, accompanied by common citizenship policies that strengthen the pact between European institutions and citizens and the democratic dimension of the European Union decision-making process, with an aim to reinforce mutual trust and a true solidarity among its peoples. In order to deepen the reflection on these issues, the Centre of excellence Altiero Spinelli (CeAS) of University “Roma Tre”, in collaboration with Associazione Universitaria di Studi Europei (AUSE), organizes the present seminar in order to offer an opportunity to point at and debate historical, legal, institutional, political and economic issues and aspects of the European citizenship, with the participation of scholars and experts. The initiative is part of a cycle of seminars organised in cooperation and with the sponsorship of La Cittadinanza Europea, Civitas Europa, and Revista de derecho constitucional europeo. In recent years, the European Union has faced a series of political and social challenges that have threatened the foundations of its integration model. Since 2008, the economic and financial crisis has put into question the achievement of the single currency and the sustainability of the European welfare system. The emergency linked to migratory flows in the Mediterranean and through the Balkan route, together with threats to European security arising from the instability of the neighborhood and terrorist attacks, led to a retreat on the principles of free circulation and solidarity in Europe. The scenario and the progressive disaffection of citizens from the European project have encouraged the emergence of populist movements and the strengthening of Eurosceptic parties, and a referendum pending in the UK to decide to withdraw from the Union. These trends undermine the internal cohesion of the Union, but also its ability to project internationally. Ultimately, the EU must rethink its model through a revision of the bases and mechanisms of the integration process, particularly in the areas most affected by the ongoing crisis. The definition of a common defense policy and the management of internal and external security are indispensable to ensure the stability of the Member States and the protection of European citizens, contributing to the maintenance of peace beyond the European Union borders while promoting more advanced forms of pooled sovereignty at the European level. At the same time, interventions in these areas must be accompanied by common citizenship policies that strengthen the pact between European institutions and citizens and the democratic dimension of the European decision-making process as a whole. In order to deepen the reflection on these issues, the Centre of excellence Altiero Spinelli (CeAS) of University “Roma Tre”, in collaboration with Istituto Affari Internazionali (IAI) of Rome, organizes this seminar devoted to the common European defense. The seminar will offer an opportunity to point at and debate historical, legal, institutional, political and economic issues and aspects of the European defense, with the participation of scholars, experts, and representatives of European and national institutions and the media. The initiative is part of a cycle of seminars organised in cooperation and with the sponsorship of La Cittadinanza Europea, Civitas Europa, and Revista de derecho constitucional europeo. MIGRANTS AND REFUGEES ACROSS EUROPE: HOW TO SHARE THE CHALLENGE FOR A SHARED WORLD OF PEACE. The Seminar will be held within the project “Pathways to Peace”, with the support, among others, of the Italian Ministry of Education, Universities and Research. The arrival in Europe of a mass of people who flee their countries of origin (especially from Syria) due to war and other situations of danger for their lives and liberties, in addition to the flux of migrants compelled to leave their countries because of poverty, has become a major challenge for Europe, from the point of view of its capacity to share the burden of hospitality, but even more for the implications of public policy at both national and European Union level, connected with integration and security reasons. Indeed, social integration, intercultural dialogue, mutual respect, on one hand, and, on the other, measures to prevent and combat illegal immigration fueled by criminal organizations, as well as to respond effectively to terrorism risks connected with conflicts on the south bank of the Mediterranean (Middle-East and African area), are all intertwined factors and aspects of a scenario in which is at stake the future of the European project of peace and prosperity. In view of the challenge thus posed by the flows of migrants and refugees, on which it also depends the challenge of peaceful coexistence and worldwide sustainable development, EU member states and institutions are called to act in a responsive way that also implies the responsibility to deepen and spread knowledge about the issues involved, in order to have, on the side of the public at large, a better understanding of viable solutions, especially concerning policy choices, affecting the life of European citizens. To this regard, university cooperation, through the involvement of research and study centers, with the participation of experts, and civil society organizations, can bring about a significant contribution in terms of analysis, suggestions and proposals. 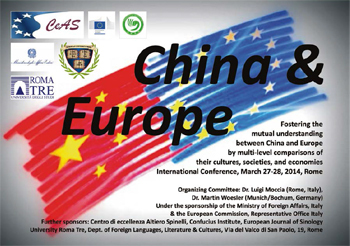 With this aim in mind, the Seminar is intended to gather scholars, young researchers, experts, as well as institutional and civil society representatives, in order to offer an opportunity to reflect and discuss on such matters, while urging the attention of competent authorities, in particular at European level. - to analyze the migrants and refugees fluxes that produced a crisis in the EU politics and culture and to produce study materials relevant for the topic; to advance proposals for managing it; and to promote intercultural dialogue on the basis of the shared values and common interests of the Countries involved (sending, transit and receiving). - defending value-based approaches as part of the process of managing the crisis, with regard not only to its emergency aspects, but also to its development prospects, by giving shape to an agreed Charter on Common Values and Principles, and making efforts for its implementation at local, national and European level. Selected contributions and the following seminar’s proceedings will be, after a peers review, published in a volume within the monographs series “Quaderni del Centro Altiero Spinelli” (http://www.centrospinelli.eu). Further, and in the alternative, single contributions will be made available on line and/or published, after a peers review, in a special issues of the journal “La cittadinanza europea” edited by CeAS (http://www.centrospinelli.eu), and in the “Journal for Identity and Migration Studies” of University of Oradea (http://www.jims.e-migration.ro), both indexed in international data bases. No more than one paper is allowed. Contact information: name, email, postal address and academic affiliation of the applicant. A 300- to 500-word abstract that includes the title of the paper and the name of the author (shorter or extensive abstracts will not be considered). A 100-word biographical summary, in narrative form (a text with the length of one paragraph). Standard CVs will not be considered. Deadline: by January, 15th, 2016 at the latest. Only selected and accepted papers will be considered for presentation during the Seminar. Only selected papers allow an invitation to assist to the Seminar. 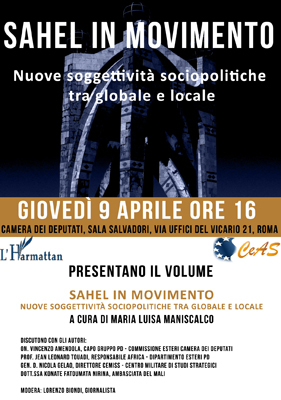 Presentazione del libro "SAHEL IN MOVIMENTO -�Nuove soggettivit� sociopolitiche tra globale e locale"
Dott.ssa Konate Fatoumata Nirina, Ambasciata del Mali Modera: Lorenzo Biondi, giornalista giovedì 9 aprile 2015 alle ore 16 presso la Camera dei Deputati, Sala Salvadori, via Uffici del Vicario 21, Roma. In occasione della presentazione del libro The Constitutional Relevance of the ECHR in Domestic and European Law.An Italian Perspective, G. Repetto (ed. ), Intersentia, si terrà, nell’ambito dei Corsi di studio in Diritto e istituzioni dell’Unione europea, Uniformazione e Comparazione giuridica, Diritto contrattuale europeo, un seminario di studi su: La Convenzione europea dei diritti dell’uomo nelle relazioni tra ordinamenti. Problemi e prospettive. L’iniziativa, destinata prevalentemente a studenti universitari e delle scuole di istruzione superiore, con una attenzione al ruolo degli educatori, ha lo scopo di fornire strumenti di informazione e conoscenza su temi di particolare interesse per il mondo giovanile. Saranno presentati e discussi progetti, azioni e mezzi intesi a favorire, nel contesto delle politiche dell’Unione, nazionali e regionali, le ‘opportunità’ offerte ai giovani di prendere parte attiva alla vita culturale, produttiva e sociale. I lavori saranno aperti da domande rivolte direttamente dagli studenti ai relatori presenti. Badrawi: Egyptian social and political landscape. Nel corso degli anni il Centro ha organizzato svariate iniziative a carattere scientifico-culturale (convegni, seminari, conferenze, dibattiti) miranti a promuovere lo sviluppo e la diffusione di conoscenze e competenze nel campo dell’integrazione europea. Il Centro di eccellenza Altiero Spinelli (CeAS) e l’Euro-Mediterranean University (EMUNI University), nell’ambito delle attività previste dall’accordo di cooperazione, hanno organizzato un incontro di lavoro dedicato alla elaborazione di proposte di progettazione di attività formative post-laurea (master) e di ricerca nel campo degli studi europei (integrazione politico-istituzionale, coesione economico-sociale e territoriale, politiche europee di immigrazione, cittadinanza europea, spazio di libertà, sicurezza e giustizia, azione esterna dell’Unione e politiche di partenariato e vicinato), incentrate sullo sviluppo delle relazioni euro-mediterranee, al fine di favorire la mobilità di studenti e docenti di paesi dell’area mediterranea, in particolare provenienti dalla sponda sud del Mediterraneo. L’incontro, coordinato dal prof. Luigi Moccia, Presidente CeAS, e dal prof. Joseph Mifsud, Presidente EMUNI, si è svolto nei locali del Centro, alla presenza del prof. Ilan Chet, Deputy Secretary General, dell’Unione per il Mediterraneo, del Rettore dell’Università di Haifa (Israele), del Presidente dell’Università Al Najah (Palestina), del Presidente dell’Istituto Euro-Mediterraneo in Scienza del Rischio e di altri ospiti in rappresentanza dell’Università di Murcia e di Cadiz (Spagna).